The Army’s fitness program seeks to improve or maintain all the components of physical and motor fitness through sound, progressive, mission-specific physical training for individuals and units. The benefits to be derived from a good physical fitness program are many. It can reduce the number of soldiers on profile and sick call, invigorate training, and enhance productivity and mental alertness. A good physical fitness program also promotes team cohesion and combat survivability. A good physical fitness program also improves soldiers’ combat readiness. Soldiers are required to take a physical fitness test at least twice per year. There are three events which are measured: push-ups, sit-ups, and a timed two-mile run. Soldiers are required to score a minimum of 60 points on each event (50 points per event in order to graduate Army Basic Training). The Army Physical Fitness Test (APFT) scores are also used in the Army Enlisted Promotion System. Commanders evaluate the effectiveness of physical fitness training and ensure that it is focused on the unit’s missions. They can evaluate its effectiveness by participating in and observing training, relating their fitness programs to the unit’s missions, and analyzing individual and unit APFT performance. The Army Physical Fitness Manual is FM 21-20, which is approved for public release and unlimited distribution. 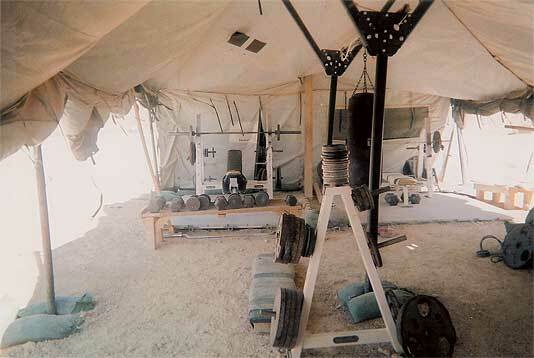 * Photo taken in Iraq shows Bench Press, Incline Bench Press, Olympic Style 45-LB Bars, 45-Pound Plates, Hex Dumbbells, and at least one Safety Squat Bar.